HOLLY POND – Holly Pond High School has seen several new teachers in the past few years. New teachers for agriculture and physical science came this year, and last year brought a new English teacher. 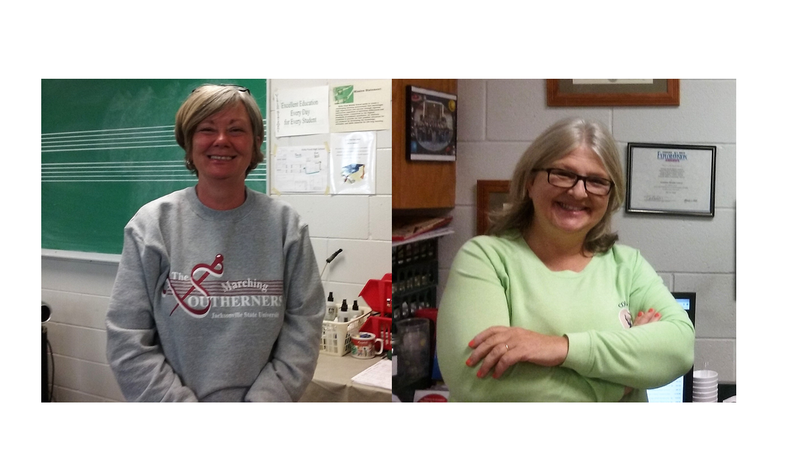 Now, the school will be looking to replace two more beloved faculty members: Luette Benefield, longtime band director, and Wilma Whateley, dynamic jack-of-all-trades science teacher. The Tribune sat down with both teachers to learn more about some of HPHS’ most popular educators. Benefield will be ending her career as a full-time band instructor after 30 years on the job. Starting at T.W. Martin High School in Walker County, she came to Holly Pond in the fall of 1992 and has been a part of the family ever since. Reminiscing on her first year there, she says that they had around 35 horn players, a small drumline and a large number of auxiliary performers. That year, she also started the jazz band, which plays during the school’s basketball games. Along with the jazz band, each year has seen its fair share of marching competitions, honor band try-outs, All-State try-outs, Solo and Ensemble performances, concerts and the annual trip to Musical Performance Assessment. Many of Benefield’s students reacted to her retirement announcement with sadness, as many had been with her since sixth-grade beginner band and had years of memories with her. Fortunately, she said, they seem to be handling it rather well and have given her many well-wishes with her future plans, which revolve around taking a part-time position at Mount Pleasant Christian School. The school would like to start a band, and Benefield plans to help them achieve that goal. After teaching for 28 years, 11 of which were spent at Holly Pond, Whateley will be retiring to raise her two grandchildren, a 4-year-old and a 21-month-old. “They deserve the best of me, not what’s left of me at the end of the day,” she explained. Whateley started her career at Anniston Middle School, where she spent six years and was recognized as Teacher of the Year by the Alabama State Department of Education. She then taught in Jefferson County for two years, received her National Board Certification during her time in Talladega County and worked as an intervention specialist for the ASDE, working with at-risk schools. She spent time in Blount County schools, before finally moving to Holly Pond in 2006. During her time at Holly Pond, Whateley made herself a well-known presence. She coached the robotics team for eight years, coached the science team every year until the county-wide shutdown, coached three InSPIRESS teams, sponsored the pep club and acted as an improvised bell every time the school bell malfunctioned. She taught seventh- and eighth-grade science, earth and space science, physical science, biology, chemistry and physics. She renewed her National Board Certification in 2008, was named Teacher of the Year for South’s BEST, and is renewing her certification again this year so she can teach her own grandchildren. Whateley recounted some moments from her time at Holly Pond that really showcased the kindness and generosity of the school family: when her husband Pete had cancer, her family worked hard to carry him to treatments and help him recover. During this trying time, the people at the school helped make sure that her family would be able to celebrate Christmas and have gifts to exchange with each other. She described how her family had needed to move, and several faculty members and two football players volunteered their time and effort to help her while Pete was still trying to regain his strength. There came a time in her life when she suffered 13 family deaths in a span of eight months, and people at the school helped cover for her by handling some of her administrative duties while she was out. She says that she has “never known a kinder, more compassionate, more giving group of people” than the students and faculty at Holly Pond. Whateley says she can happily say she has no regrets from any part of her career. She says she wishes she had gotten her doctorate, but considers that a goal she hasn’t met yet rather than an actual regret. She says she’s met all other goals she set for herself, and will continue to meet her goal of caring for children. Along with her grandkids, she plans to foster other children in an effort to help give them the life they deserve.